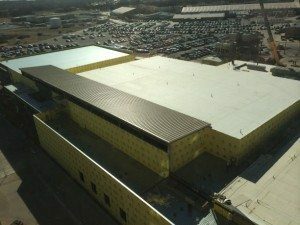 Progress is moving along nicely for one of our largest upcoming projects, the WinStar Convention Center. We first told you about the convention center back in October, when the steel beams began setting the initial framing for the huge building. Back then, it didn’t look much like a building, but a lot has changed, trust us. The exterior walls have gone up, and they are now waterproofed to protect the building. Concrete paving is completed on the exterior surrounding the building, and the roof is nearing completion. If you think it seems like a lot of work has been done on the outside, just wait until you hear all the progress that’s been made on the inside of the new convention center! 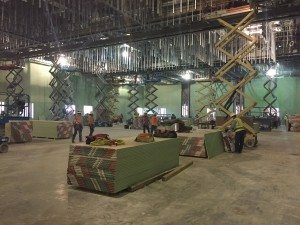 The ceiling of the grand ballroom has been framed. That’s the 15,000 square-foot ballroom, by the way. Even more work is continuing at other locations throughout the building. Remember when we told you about the 12,500 square-foot kitchen? We recently began receiving the equipment that will one day prepare millions of delicious meals, hors d’oeuvres and desserts for countless events. Additionally, sheet rock and windows are being installed throughout the building as the new A/V equipment is installed. We can’t wait to test out the new A/V system for our first event. With a whopping 65,000 square-feet of new facility, we are looking forward to opening the new convention later this year. Be sure to follow us on Facebook and Twitter for even more updates on this brand-new facility and be the first to know when the convention center is officially open to the public. Next time you stop in for a visit, remember to check out the new building (from a safe distance, of course) and share your photos with us on social media!